One of my earliest known car photographs, at 6 or 7 years of age. I think I was maybe 6 or 7 years old. I remember always borrowing my Grandma's camera to take photos. 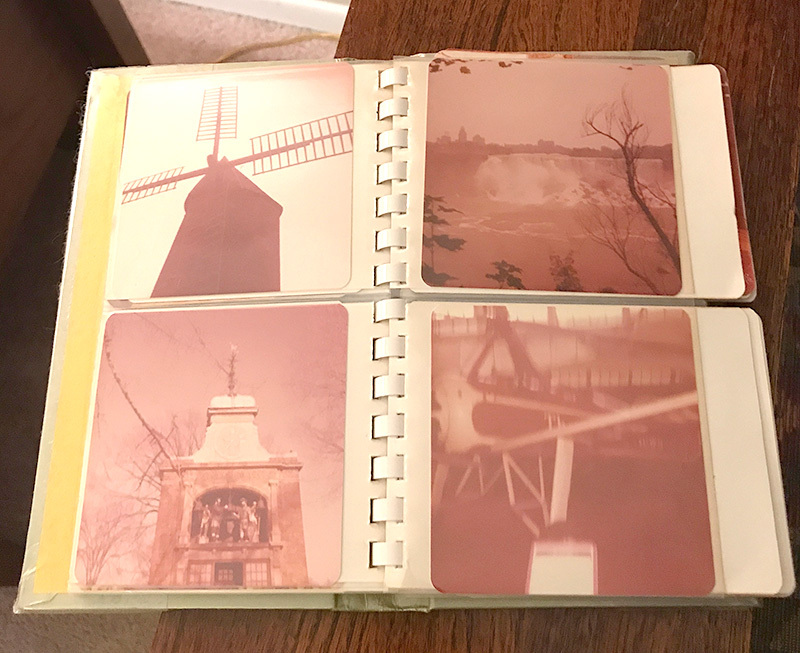 I can't remember what her camera was, but I'm guessing the photo above was shot using Kodak 126 film, which provides a square format when printed. I was intrigued by the square flash bulb on the camera that would rotate each time you took a photo, giving you 4 flashes per cube. I found another old camera of my parents that used individual bulbs that you would remove after each photo. I would sit there with no film in the camera, and just pop off flashes because I thought it was so cool! Here are the pictures you took with my camera. You didn’t get all the cake in when you took Kathy’s Confirmation cake picture. But now you can see what you have to do next time. Hope you are all better and over your cold. I'm so happy to have this letter from her, it's from such an early time in my childhood! It's having treasures like this that really reconnect us back to our loved ones. Here are a few of those early photos of mine. 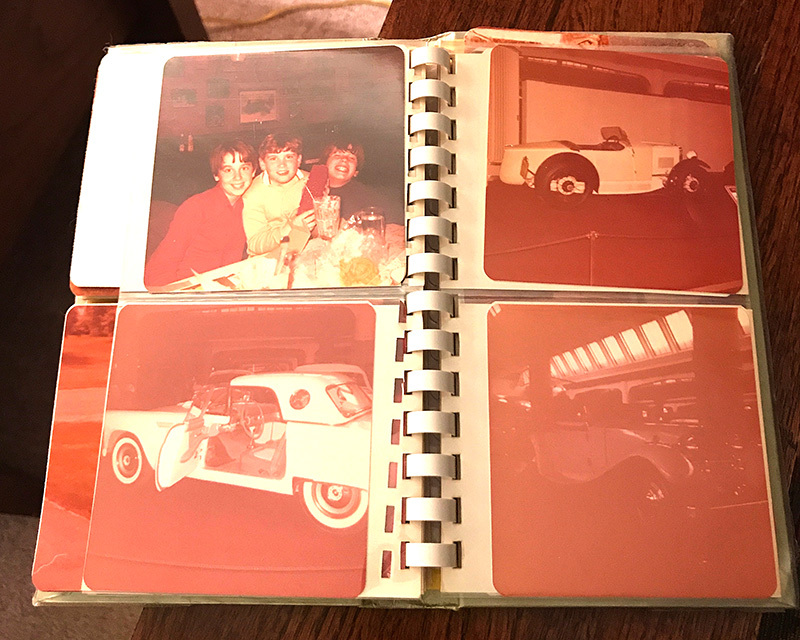 The aged look of these photos...the colors are so horrible, but that gives them character! My photography "career" took a pause for awhile, as I spent more time in school with sports and music. When I was was 13 or so, I remember my mom would use an Olympus 35mm film camera for some of her work projects. I thought that camera was so cool! When it came time for me to graduate from high school, my parents asked me what I wanted. "I want a camera JUST LIKE MOM'S!" I remember saying those exact words, so it must have meant a lot to me, and hoped I would get one. Well, I got a camera. Except it wasn't an Olympus like my mom's, it was a Minolta X-370 35mm film camera, which I still have, and to me, looked exactly like hers. The camera had full manual controls. You had to LEARN how to make photos. This was old school photography, and that's what I wanted to learn. One of my prints from MSU, circa 1990-92. Notice the automotive subject matter!! After college, for some unknown reason, I put down my camera...for years. It wasn't until I ran into a friend from high school who was sporting a new Canon Rebel 35mm film camera. I thought, "That's pretty cool! Maybe I should get one?" So, I did. I only had the "kit lens" that came with it, and I enjoyed using it for it's "full auto" capability, requiring me to do less work as a photographer. But I soon grew bored with that camera, and once again, stopped shooting photography. Fast forward a few years, and we are now in the year 2005. The digital photography technology had been around for awhile, and we were way beyond the 1 megapixel camera. I decided to pick up one of these new fangled "digital" cameras, which was a point-n-shoot Canon Powershot. It had FIVE megapixels. I loved the compact design, and the resolution was decent for making small prints and posting them online. It had a fixed zoom lens that would retract into the camera body, making for a nice, neat package for carrying in your pocket or for travel. But the thrill waned soon after. I just wasn't able to create the photos I would see in the stock photo books in my office. THOSE were the types of photographs I wanted to make! Enter the DSLR. Photo of the Grand Canyon. Taken with my Canon Powershot camera from my first class seat, on my way to CA to shoot TV commercials for Campbell-Ewald advertising. My coolest photo with that camera! Around 2006 or 2007, my friend Marty picked up a Canon Digital Rebel DSLR camera with a 50mm 1.4 prime lens, and wanted me to check it out. He knew I was a shooter of sorts, (and at least worked in the creative department in our office) and wanted to see what I could do with it. It had been a few years since I had to use the "exposure triangle," and I actually found myself having to RELEARN it since I last used it in college. After spending the afternoon trying each other's cameras, I knew at that moment, that I needed to get a DSLR. Not wanting to settle for the current tech, I waited awhile and did my research on everything out there. I decided to stick with Canon, and got a Canon 30D DSLR, with the 17-85mm kit lens, which was a great starter lens. I then added a 50mm 1.4, 24-70mm 2.8L, and 70-200mm 2.8L IS to my arsenal. My photos were starting to get noticed by friends, and soon I was asked to shoot someone's wedding. I eventually shelved the Canon 30D, and bought a Canon 5D Mark III, the latest offering at the time from Canon. It worked well with all my existing lenses, so I didn't need to invest more money in glass. Around this time I got a request to shoot some very high-end Porsche sports cars for a local car collector. That gig was great, and I got to see some very rare and very expensive cars that many people would never get to see in person. I still have my original Minolta X-370 35mm film camera, the Canon Rebel G film camera, the tiny Canon Powershot point-n-shoot camera, and my Canon 30D, but I sold my Canon 5D Mark III and most of my Canon lenses late 2016. Did I give up on photography again? Nope! I totally switched camera brands!! Stay tuned!